Entry fee : Tests 1 to 3, $40:00 (Inc DV Levies & Catalogue). Cheques to be made payable to ESODC Inc. Entries to be sent to: Mrs Andrea Sciberras, 11 Ottawa Avenue, Blackburn,VIC 3130 Ph 9877 1528 (no calls after 9:00pm). Mobile on the day of trial only 0419 877 152. Conditions of Entry: A stamped self addressed business size envelope must be included with entries. Please advise ASAP if you have passed at another trial prior to our ballot. Exhibitors please note: A ballot will be held at 11 Ottawa Ave Blackburn at 7:30pm on 13th June if excessive entries are received. Affiliated with the DV and the fixture to held under the rules and regulations of DV and a copy may be perused at the office of the secretary of the fixture. If tracks become available a ballot will be held for those who may wish to track on. Entries to be sent to : Mrs Andrea Sciberras, 11 Ottawa Avenue, Blackburn, VIC 3130 Ph 9877 1528 (no calls after 9:00pm). Mobile on the day of trial only 0419 877 152. Exhibitors please note : The committee reserves the right to reallocate or appoint additional judges in response to entries. One entry per form per class stating jump height category for open and utility entries. Heights: For Rally show jump height category. 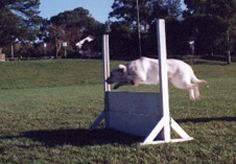 Rally O to be judged concurrently with Obedience Trial. Walk Through: 10 Minutes before start time. No late entries accepted. Awards: Trophy and sash for each class winner. Sash for second and third placings. Qualifying score and Title ribbons. Parking is available in the street and scout car park across the road. There may be a couple of spaces left after Judges and Stewards have been accommodated in our small car park. Thank you for your understanding and supporting our club. Please remember we have residents living nearby, and we respectfully ask you don't allow your dogs to bark continuously. Affiliated with the DV and the fixture to be held under the rules and regulations of the DV and a copy may be perused at the office of the secretary of the fixture.